Mbambo reminded Members of Parliament the SAAF was mandated to defend and protect South Africa and its airspace by providing, annually, four helicopter squadrons and one combat support squadron; providing three medium transport squadrons, one maritime and transport squadron, one light transport squadron and nine reserve squadrons at required readiness levels a year; providing one air combat squadron, and providing a 24-hour, 7-day-a-week air command-and-control capability. a “low availability of systems, due to funding shortages,” low experience levels of ground crew resulting in services taking longer to complete and production errors on the A109 fleet that decreased availability. The ratio of Oryx commanders to co-pilots was also unbalanced with “too few commanders”. In the transport & maritime surveillance arena, 11 825 hours were planned with 11 179 flown. Reasons for the shorfall included scheduled and unscheduled maintenance activities, technical failures, accidents, a lightning strike, long lead times on spares and insufficient technical personnel to maintain required servicing schedules as well as financial constraints on some maintenance activities. Mbambo also noted that many of the aircraft in this category were vintage, the Douglas C47TP Dakota, for example, clocking in at 66 years. In the air combat category 950 flying hours were planned and 715 flown because of a “substantial underfunding of systems.” Also to blame are long lead-times on spares and the fact that the Saab Gripen support package has not yet been fully delivered. “Major software upgrade was performed to ensure all aircraft are on same modification baseline. Software upgrades on [the BAE System Mk120] Hawk affected availability.” Mbambo warned that components in repair loop had long turnaround times. He noted that the Hawk system's warranty service contract will shortly lapse, meaning the “situation will get worse in the current & future years”. Twenty-four of the aircraft were delivered between 2006 and 2008. Mbambo warned that the combat system was in the balance and “will require intervention to prevent loss of the required capability.” He noted that due to inadequate funding of the Hawk and Gripen systems since the onset of integration, “the Air Force has not been able to generate the required number of flying hours and re-provision the systems adequately.” Short-term interventions in lieu of money included investigating the use of the Pilatus PC7 MkII as a cheaper alternative to the Hawk to gain flying time and to fly the Gripen “at minimum to maintain system integrity and to maintain competencies only,” with greater use of simulators. However, any system integrity loss involving the A109, Hawk and Gripen “would result into more serious problems and expenses” for the SAAF, the state and ultimately the taxpayer. 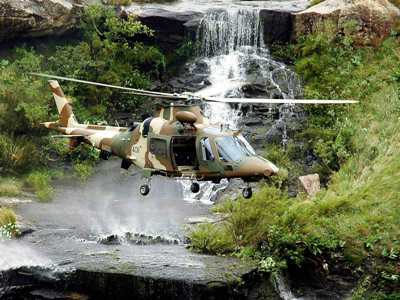 The SAAF also worries about funding upgrades the operating budget. In the past some upgrades have been partially funded from the operating budget, for example Project Drummer (the Oryx mid-life upgrade that commenced around 2006) because the provision on the capital budget was inadequate. Another worry is the cost of relocating AFB Durban from the former Durban International Airport to King Shaka International Airport (KSIA). Moving the base will cost R729 million, which is not available. Remaining at the old facility is also not heap: R27.2 million is needed to replace some temporary buildings at the present base to sustain rotary wing operations. ositives included 32 866 flying achieved with just one major aircraft accident – the loss of an Agusta A109 with three fatalities. In addition, 26 pilots qualified for wings,with 11 allocated to transport & maritime, 10 to helicopters and five to the air combat environment. Mambo also reported the Hawk as fully operational for combat training. The main runway at Air Force Base Waterkloof had been upgraded and the base re-opened for flying operations. The commercialisation of messes had also resulted in savings for the SAAF, while air traffic control training within SAAF with the Air Traffic Navigation Service of the Department of Transport contributed towards resolving air traffic controller shortages. Mbambo urged that “a fair balance between mandate and allocation needs to be found.” THe impact of the SAAF's low funding levels included reduced flying hours, less support to operations, including peacekeeping, crime fighting and border patrol and greater difficulty keeping scarce skills and improving demographic representativity. Ultimately, it led to a inappropriate balance between capabilities. With acknowledgements to Mzilikazi Wa Afrika and Sunday World. *1 Major acquisitions are planned and budgeted over at least a 20 year lifespan or lifecycle. And these were not new systems, but in the case of the SAAF replacement for Mirage, Cheetah, Impala and Alouette, while in the case of the SAN they were replacement of the President-call frigates (Type 12?) and in a way the Warrior-class (or Hero-class) strike craft. So the budgets just had to be there. the SDPs (Arms Deal) were a scam to enrich the local ruling party, its top fish and the overseas suppliers. In the meantime the Arms of Service are pathetic and the RSA Defence-Related Industries either bankrupt or depleted. Except of course Denel which gets R5 billion a year of taxpayers' money to keep it afloat - most of it being used for more wasteful expendture.